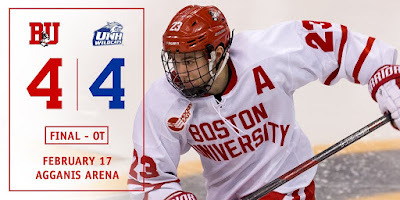 #4 Terriers rallied twice from two-goal deficits to earn a hard-fought 4-4 overtime tie with New Hampshire at Agganis Arena. BU received second-period goals from Jordan Greenway and Bobo Carpenter and third-period goals from Charlie McAvoy and Jakob Forsbacka Karlsson. The Wildcats had the upper hand in the first period, scoring a power play goal just three minutes in and then doubling the lead when Ara Nazarian pick-pocketed Brien Diffley at the edge of the crease and beat Jake Oettinger. 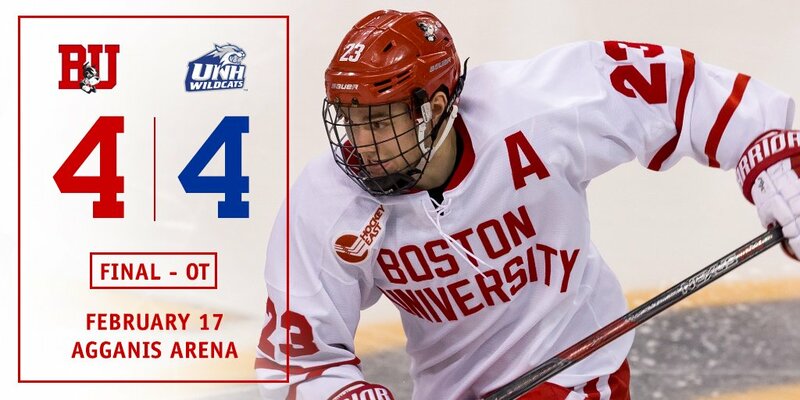 Momentum shifted in the second period after an especially effective penalty kill by BU. Then at 6:17, Greenway wristed a McAvoy pass past Daniel Tirone to get the Terriers on the board. Three minutes later, Patrick Harper set up Carpenter for a power play goal to bring BU even at 2-2. UNH responded with a blast from Dylan Chantier from the high slot and Tyler Kelleher’s rip from the left faceoff dot to restore its two-goal margin. Momentum shifted again just 40 seconds into the final period when McAvoy’s shot from the point went past a screened Tirone to cut the lead to 4-3. It was all BU after that with the Terriers firing another 15 shots on net, many of the grade A variety. But they weren’t rewarded until 15:36 when Greenway controlled the puck behind the UNH net and found Forsbacka Karlsson for the equalizer. “I thought they played well. I thought a bunch of guys played well,” Quinn said. “After the first period we dusted ourselves off and said let’s just go play hockey. What I liked tonight is there was a lot of zone time. We were less defendable down low. We got more pucks to the net which got them turned around." The teams will complete their home-and-home at The Whittemore Center in Durham tonight at 7 p.m. The game will be broadcast online on ESPN3. BU added another high-end defenseman to its recruiting pipeline with a commitment from 6’4” Cade Webber. A native of Pittsburgh suburb Meadville, Pennsylvania, Webber is a freshman at The Rivers School, coached by former Terrier All-American, NHLer and U.S. Olympian Shawn McEachern. He has a goal and 15 assists in 27 games. Webber joins Lawrence Academy defenseman Braden Doyle, Avon Old Farms forward Trevor Zegras and CIH Academy center Dylan Peterson in BU’s 2020 recruit class. All three are considered strong candidates for the National Team Development Program. 2. Cade Webber, #8 Rivers, Fr., Defense, Shoots Left, 1/5/01, 6-4/175 - A Pennsylvania native, he's still very raw, but his size and physical tools have several big time schools intrigued. He's being pursued by Penn State, Providence, BC and BU among others, several of whom have offered. For a big kid growing into his frame, his footwork and first step are impressive, but he'll only get better as he continues to develop. His mobility and gaps are strong. He skates with his head up and has good reach. Once he continues to bulk up his lower body strength, his skating should get even better. Last month Webber was drafted by the Jersey Hitmen in the futures draft for the National Collegiate Development Conference, which is the USPHL's tuition-free division that will drop its inaugural puck in September 2017.